Yeast feeds on sugars. It produces alcohol (ethanol) and carbon dioxide (CO2) as waste products. Most of the ethanol evaporates during baking, so that is generally just ignored. The carbon dioxide on the other hand is the gas that causes the dough to rise. This is done by it forming carbon dioxide bubbles inside the dough. At first the bubbles are small but they then gather in still larger bubbles, when the walls between the small bubbles burst due to pressure. The more carbon dioxide there is in the dough, the harder it becomes for the yeast to survive. This is one of the reasons that you punch down a dough. So that the yest the yeast can "breathe" again. The rule of thumb in when baking is that you should only use as little yeast as it is necessary in order to achieve the objective. Too much yeast will will make the bread rise fast, but will also result in an aftertaste of alcohol. It will also use up all the sugar in the flour. When the yeast no longer has any sugar, it dies, and a substance called "glutathione" will leak from the yeast cells and out into the dough where it will destroy the gluten proteins. This will result in a porous and non-elastic dough. The glutathione also results in an ammonia-like taste. The same thing happens if you freeze a dough. The yeast cells are punctured by ice crystals. It is therefore best to only freeze baked or half-baked breads. Most recipes are made so that the dough needs to ferment for between ½-1 hour, and then proof for just as long. Yeast in itself is a kind of fungus or mold. Sourdough also has yeast in it, but it consists of a mixture of wild yeasts and bacteria. It is the bacteria that gives it the sour taste. Sourdough cultures are different around the world, so a loaf of bread made from sourdough started in Denmark are different from one made of sourdough started in San Francisco. If you want a large fluffy bread, with a lot of air holes, far the easiest way to achieve that is with yeast. Yeast used to be part of a wild sourdough, but scientists spend a lot of time isolating the most effective yeast strain they could find. This strain is then grown in factories under laboratory condition to make the yeast we know. It is possible to buy yeast from different strains from different manufacturers. Bread that is fermented with a sourdough is simply not as airy. But getting that sourdough flavor cannot be achieved with yeast. Sourdough makes for a nice rustic bread. Once in a while I even make a white bread that is fermented with a sourdough. But then I usually use both plain yeast and a wet preferment made on sourdough. This is a good compromise to achieve both a fluffy an airy bread and the sour flavor. 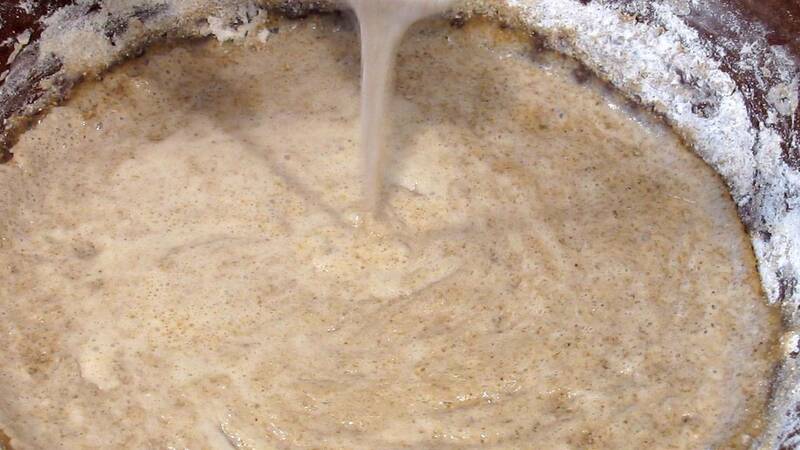 It is an advantage to use as small a quantity of yeast as possible in this kind of mixed fermentation. The less yeast you put in, the better you can taste the grain itself. It also has the advantage that with only a little yeast, the longer it need to ferment, and the longer the bread ferment, the less time you have to knead it. That is easier on the arms. 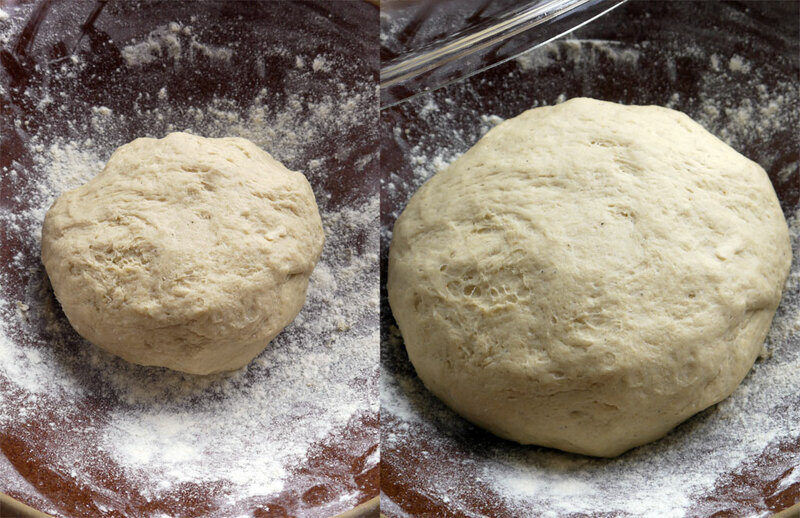 The straight dough: When you make a loaf of bread, you can either use a preferment, or you can mix the yeast directly into the dough. Most of us only know the recipes with yeast, where you just mix the yeast into the liquid and then mix in the rest of the ingredients after that. Preferment: This can be made in several ways. First there is the dry preferment, and then there is the wet. A dry preferment is like a bread dough in consistency. It does not stick to any significant degree and it is easy to shape. A wet preferment has a consistency mostly like of a thick porridge. This is also called a "pate fermentée" or a "biga" after the French and Italian names. A Pate fermentée is made by either saving some dough from a previous fermentation. Just as we are used to in Denmark when we bake sourdough rye bread. Or by making a small portion of dough the day before and then ferment that. The day after you add the remaining ingredients for the bread you actually want to bake. It provides a good "long-term fermented" flavor for the bread, which still can be baked relatively quickly. Biga is from the Italian tradition. It is made by making a dough from yeast, water and flour. Without any salt, which inhibits fermentation. So you can get away with using less yeast in a biga, which makes for a better taste. A biga may contain as little as 0.5% yeast. These are also called "poolish" (after polish / polish) or "regular sponge" in English or "Levain levure" in French. Poolish: usually consists of equal parts of water and flour. Flour 100% and 100% of water by the baker's percent formula. Add as little as 0.25% yeast. The very wet dough, without salt, is ideal for yeast cells. It requires a long fermentation time though. It is not unusual to add more yeast when the poolish is mixed into the final dough, so that it can ferment properly. Regular sponge: is made by mixing all the yeast in some of the flour and liquid, as little as one hour before the final dough to be mixed. It does not result in as much a taste as a poolish, but is a good alternative if you are busy, and it can be used to improve virtually any recipes for fermented yeast bread. Specifically, it helps on a rich/fat dough, since fat inhibits the yeast if you make a straight dough. There is a number of enzymes in grains and flour, which only becomes active when wet. The enzymes extracts the sugar in the grain so the yeast can grab them. We can use this to our advantage by making a soaker. Yeast thrives best at body temperature. Approximately 37°C (98.6°F). This is where the fermentation is the strongest. At that temperature the number of yeast cells doubles approx. every 2 hour. But surprisingly there is no benefit to ferment bread at that temperature. The yeast likes it, but the bread gets worse in the end. The enzymes that extracts the sugar from the flour needs a lot of time to work. You actually get better results by letting it ferment for a while in the fridge. You can mix it at night with only a little yeast, and let stand in refrigerator overnight. Take it out and let it rise until doubled in size. This develops a lot of complex flavor molecules. This process of letting the enzymes in the flour do its work while in the fridge is called autolysis. If the dough is a mixture of sugar, milk, fat, etc. The most of the taste comes from the added ingredients. Then it is an advantage to keep the fermentation time as short as possible. It is typical in cakes there is added the like. Wishing you still not an airy and chewy crumb full of bubbles. It is generally always a bad idea to ferment the bread at a temperature higher than room temperature, of around 18°C-22°C (64°F-72°F) degrees. So if you do your baking on hot summer day, you should try to plan it so you can let some of the fermentation take place in the refrigerator. Enzymes are complex proteins that promote biochemical processes. The enzymes are not used up in the processes. As soon as an enzyme has done its magic on a molecule, it continues to another molecule and repeats the process. In this context you can just think of them as small scissors that cut stuff in into pieces. 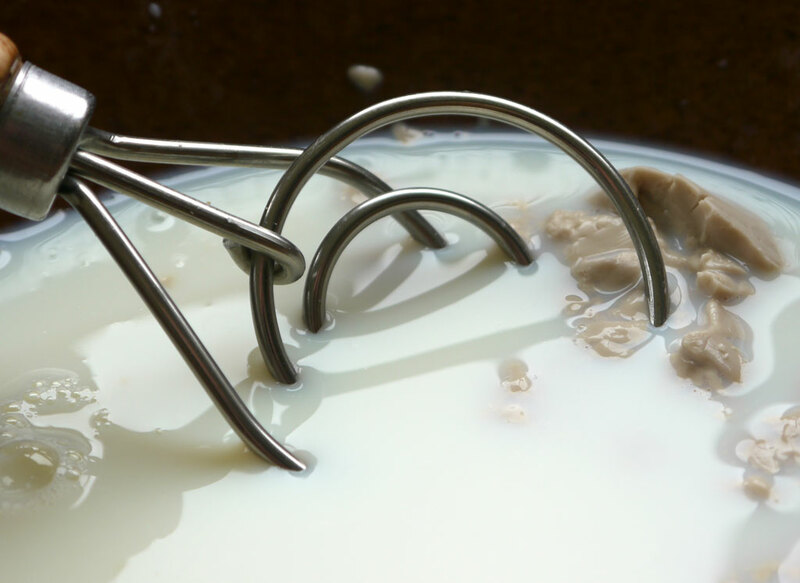 "Strings" of protein molecules are cut without the scissors(enzymes) breaking. The scissors then continues to the next string. Enzymes are very precise and they only "cut" the exact molecules they are meant for. In the article on mixing and kneading bread, I described gluten as cooked pasta. Imagine now that the proteins in the flour consists of cooked pasta that is rolled into large chunks along with sugar. When adding water and kneading those clumps loosen up. The enzymes will also be able to cut the "pasta strings" in the clumps and let that proteins unfold into long strings. Just like cooked pasta in a bundle. Meanwhile the the sugar is released from the clump. In a dough the "sugar" will be mostly starch, but for the yeast that is the same thing. If you taste some uncooked flour, it tastes terrible. This is because the sugar is bound together with the "pasta". When you unwrap the sugar and the proteins in the dough it tastes better. The yeast gets something to eat and gluten can help shape the bread. It is also the sugar that is released this way, that is being browned on the outside of the bread and gives a sweet taste in the crust. Another one of the secrets of making a good bread is to stop the fermentation in time, so that there is still some sugar left in the dough. Most cake recipes using chemical leveling. It is usually done with baking powder . Baking powder consists of a number of safe chemicals that develops carbon dioxide, like yeast. It happens when the baking powder gets wet, and even more so when it gets heated. In cakes, where you can usually only tastes the ingredients such as sugar, cocoa, orange or whatever else you put in, it is not necessary to pull the gluten out out of the flour. In fact, it is a disadvantage since it can make the cakes chewy. Cakes are often made with a "weak" flour with low protein/gluten content. If there is acid in your dough you should also add some baking soda. If not, the baking powder will not work properly. It is difficult to know exactly how much should be put, as it changes in relation to the acidity and quantity of the dough. I typically us 1 teaspoon to 2½ dl (1 cup) yogurt and ½ teaspoon to 1 dl (½ cup) orange juice. There's nothing wrong with using baking soda. Even though it is a chemical. It is quite harmless. It also makes it easy to bake a type of cake that would otherwise be difficult to make with yeast alone and yeast will not work better anyway.